In 1998, WE ACT partnered with NYC Community Board 9 to organize the Harlem-on-the-River Project. Our goal was to engage community leaders and residents in developing a community-driven plan that would both increase access to the Harlem waterfront and raise interest in one of Northern Manhattan’s neglected neighborhoods. Working with over 200 residents, elected officials, and representatives from the New York City Parks Department, a community vision plan for the waterfront was developed and submitted to the NYC Economic Development Corporation (EDC) by WE ACT in 1999. In late 2000, EDC scrapped its requests for proposals for commercial development at the site and developed a master plan based on the Harlem-on-the-River community plan. Approval for the final West Harlem Waterfront Park plan came in 2003 and applications for construction were quickly completed. A groundbreaking took place in October 2005, and construction on the park was completed in late 2008. 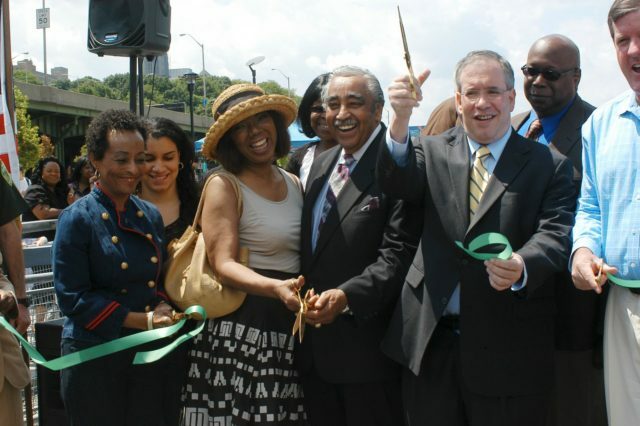 On May 30, 2009 the park was officially opened as the West Harlem Piers Park. 2009: In 2000, WE ACT’s organizing efforts led to the New York City Economic Development Corporation developing a master plan for the neglected Harlem waterfront, based on the community’s vision for more green space and waterfront access. After 9 years of community organizing efforts, on May 30, 2009, the West Harlem Piers Park was officially opened to the public. As the park has moved from vision to reality, WE ACT has continued its work to ensure that the Northern Manhattan community will be able to both access it and play an active role in its administration, operations and programming. In 2005, WE ACT created the Harlem Waterfront Council (HWC), a non-profit entity incorporated in New York State with its 501 (c)(3) status pending. HWC seeks to aid in the management of the park, as well as educate the general public, media, public officials and community residents on the importance of the Harlem Piers. In late 2007, the Mayor’s office commissioned WE ACT to organize a broad-based steering committee and community-based charrette process that would work to find the best possible use for the MTS at 135th Street, which is adjacent to the park.